Sometimes the best thing about science is that it doesn’t always work out like you thought it would. This happened to us when we ended up with a cool and slimy Conversation Heart Goop, instead of the slime we were going for. 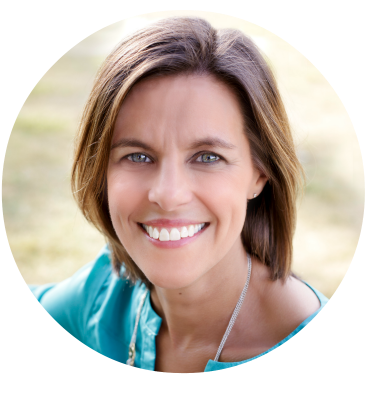 The process is half the fun, and I think that failure is important for kids – especially those that tend to be perfectionistic – to face when they’re young, and in a safe setting. 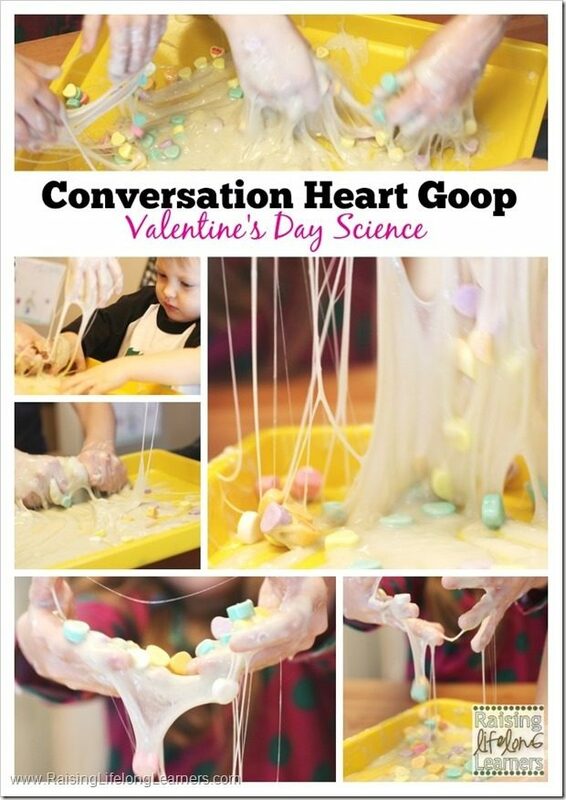 We’ve made slime dozens of times, and have put numerous twists on it – from Dragon Scale Slime to Snail Slime – and we figured conversation hearts would be a great addition to our basic “no fail” recipe. Instead we ended up with Conversation Heart Goop. Doesn’t it look delightfully gooey? 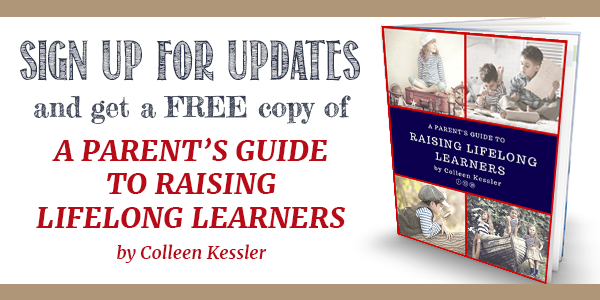 It was perfect for my sensory-seeking kids, and the toddler was fascinated. Slime is usually a pretty no-fail recipe: 2/3 cup white glue mixed with 2/3 cup water in a bowl, then 2/3 cup liquid starch in another bowl. Pour the glue mixture slowly into the starch while stirring. Stir until it all comes together. If you want, you can pull it out of the bowl at this point and knead it with your hands, or just let your kids play. 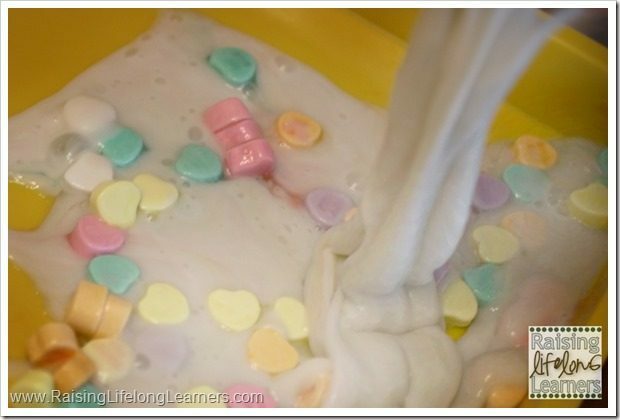 This time, we threw the conversation hearts into the mixture, and kneaded it all together. At first, it was a delightful, chunky, sensory slime. The perfect texture. And then the candies began to dissolve into the slime. 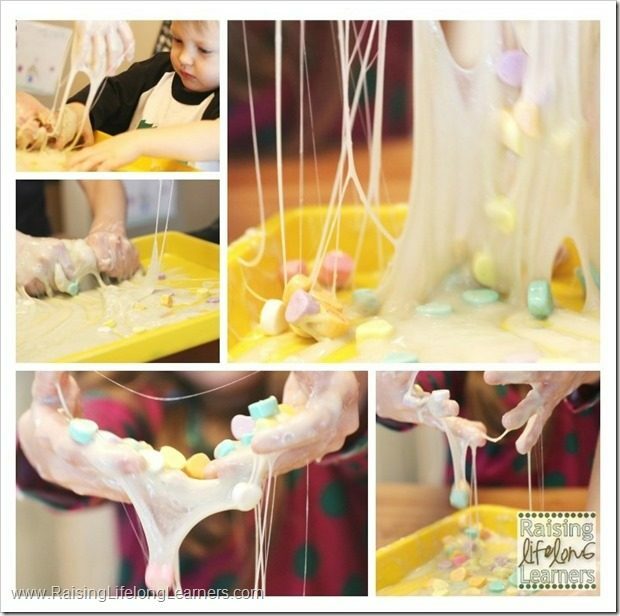 It smelled fantastic, and the kids loved it – stretching and pulling the slime like taffy. As the sugars and coloring from the candy dissolved more and more, though, it became more like goop, which is a bit more watery. Conversation Heart Goop doesn’t keep, unfortunately, so you need to make sure you throw it away when you’re done playing with it. 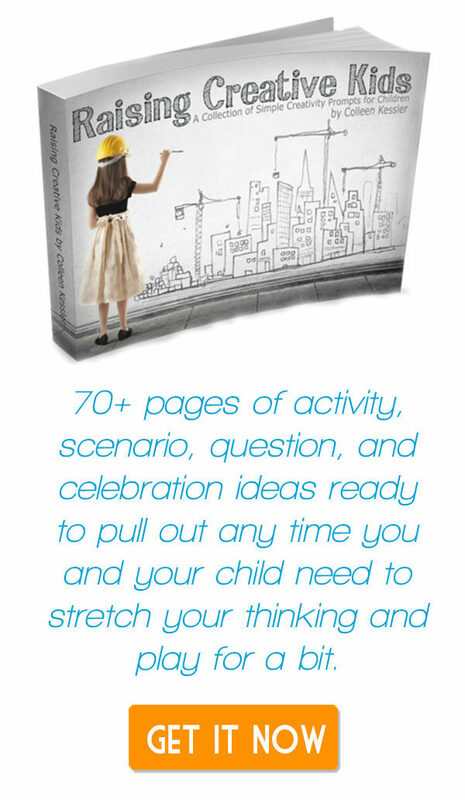 It does clean up easily, though, and should get you some quiet and engaged kids for a long while. It’s really cool stirring it around and watching the colors bleed from the hearts into the goop, turning it to a purplish-grey color. My kids returned to it several times over the course of the day. Let me know if you try making this. 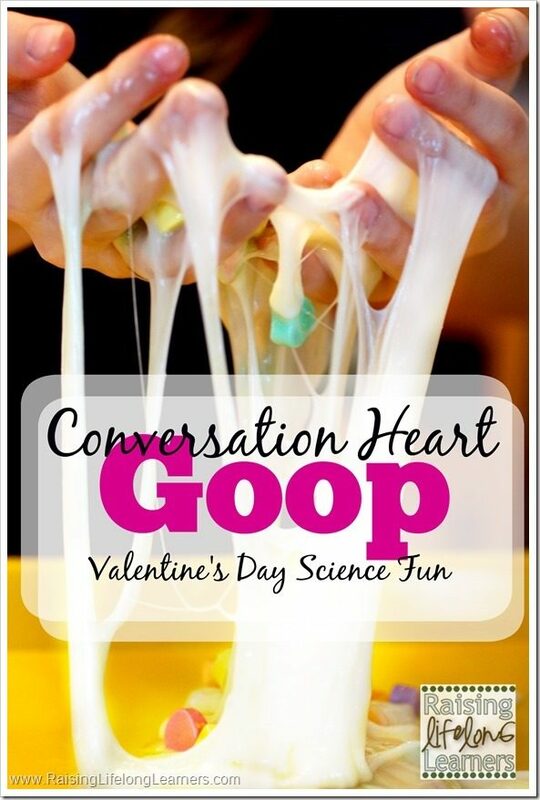 I would love to know what your kids thought about the melting hearts and the sticky goopy feel of this Conversation Heart Goop. 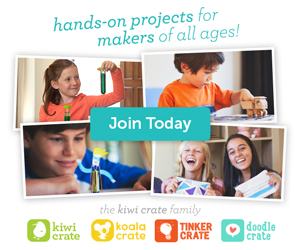 Follow Raising Lifelong Learners’s board Sensory Play on Pinterest.